Thinly sliced zucchini baked just so becomes something very chip-like for those seeking a crispy snack that's solidly in the vegetable family. 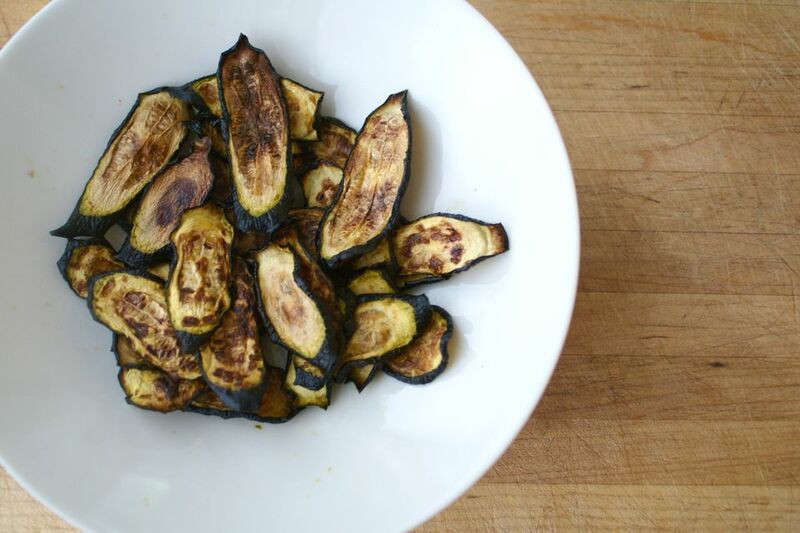 These "chips" are browned and dehydrated zucchini, plain and simple. They develop a great texture with a light zucchini flavor, but need to be watched carefully—if they over-brown (or brown all the way through) the flavor turns from gentle zucchini to harsh charred. Ovens vary tremendously in how accurate their thermometers are, how the air circulates, etc. so you will need to pay extra attention the first time you make these—the timing could be off by as much as 5 minutes at any stage. Sounds fussy, I know, but once you figure out what works in your oven, this healthful snack will be a breeze to make! One more note: zucchini prepared this way shrinks by at least half, so while 2 zucchini may sound like a lot, it's about how much as fits on a single large baking sheet. If you decide to double or triple up, be sure to turn and switch the pans around so the chips cook evenly. Cut the zucchini into 1/4-inch-thick slices. The more even you can make them, the better. If you have a kitchen mandoline, now is a great time to use it. If you have parchment paper, line a large baking sheet with it. If not, lightly spray a large baking sheet with oil. If you don't have spray oil, brush or dab it on very lightly. Lay the zucchini slices in a single layer on the prepared baking sheet. Lightly spray the slices with oil, turn them over, and lightly spray the second side. While more oil is often better when making tasty food, too much oil here will keep the zucchini from crisping up, so while you want them evenly coated, you really don't want them drowning in oil. Sprinkle the zucchini with salt. Bake until browned on the bottom side, about 15 minutes. Turn the zucchini slices over and bake another 10 minutes. If they are browning at markedly different rates, move the slices around on the pan to even the browning out a bit. Reduce the heat to 225F and bake until the zucchini are browned and have shrunken to about half their original size, 30 minutes. Let the zucchini chips sit a few minutes. They will crisp up as they cool. Serve sooner rather than later, because they will soften as they reabsorb any ambient moisture. I strongly recommend getting the method and timing for your oven down before trying any variations, but once you do, there are endless ways to add more flavor and fun to these healthful snacks.